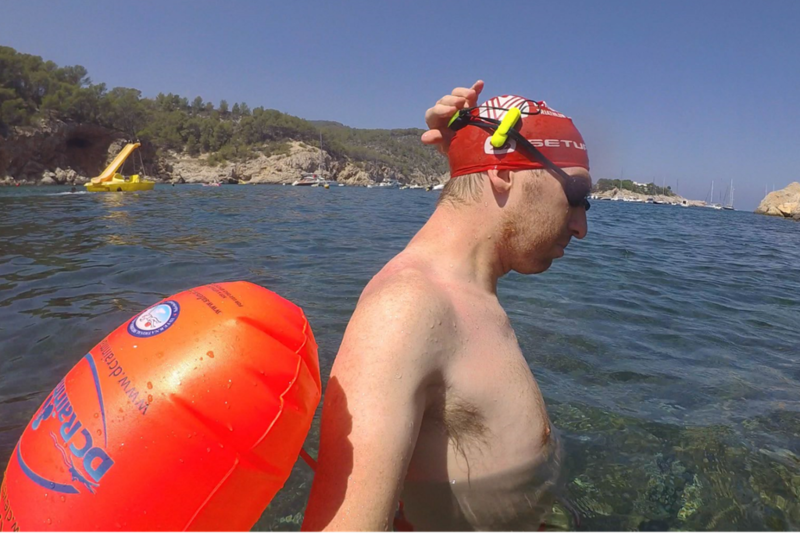 I mentioned yesterday in my Ibiza weekend post that I had used the Marlin GPS swim meter during one of my recent openwater swims. I figured I’d put together a short post to dive into a bit more detail on how it works, before their Kickstarter campaign officially closes tomorrow (almost exactly 22 hours from when I’m posting this). I didn’t exactly realize their Kickstarter campaign was closing so soon, else, I’d have gotten this up over the weekend. In any case – this should give you enough insight to make a decision on whether you want to join in their campaign now, or wait until later when they ship. So let’s not waste any more time…time to begin! So, what is the Marlin? 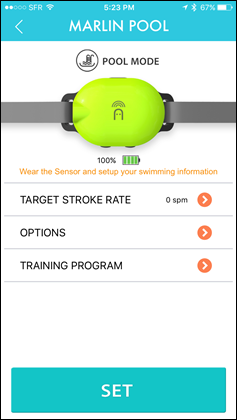 Well basically it’s both an openwater and pool swim tracker. 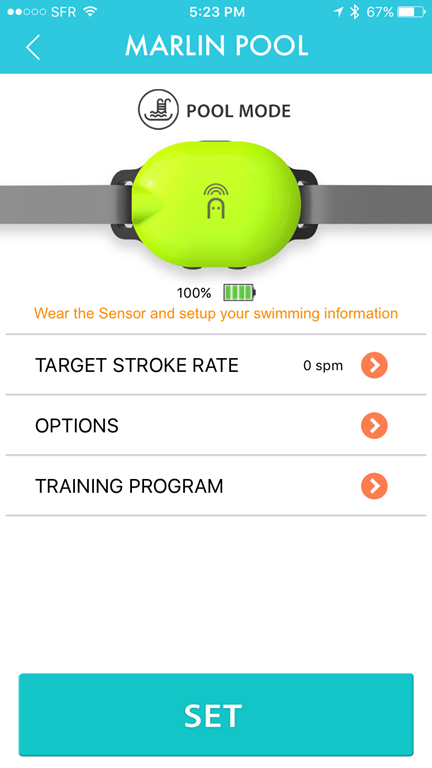 Indoors it’ll use accelerometers, like most swim watches, but outdoors it’ll use GPS (also like most swim watches). 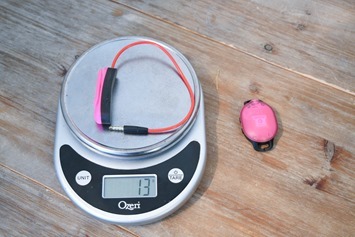 But the key difference between the GPS here and the GPS on swim watches is that the Marlin sits atop your head. This gives you better GPS accuracy than algorithms that try and figure out where you swam based on taking lots of less-accurate data from your wrist (GPS points in between swim strokes). 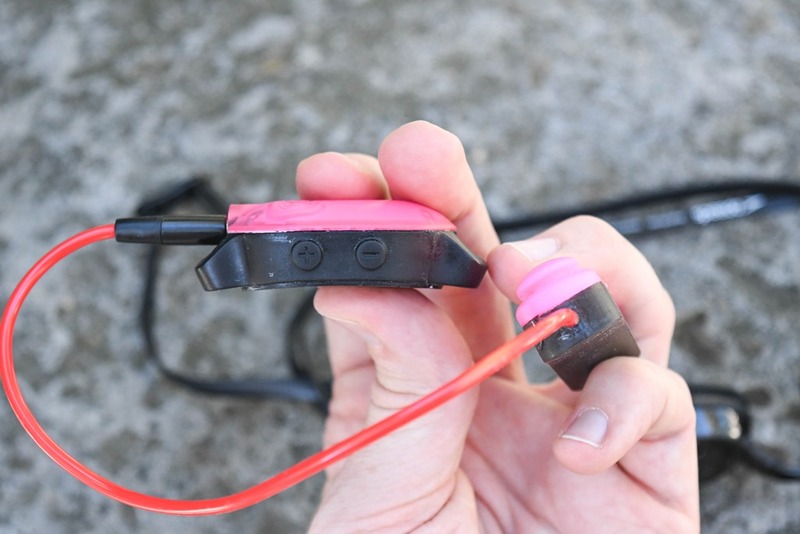 The hardware itself has two pieces connected by a small cable, similar to that of swimming music players. 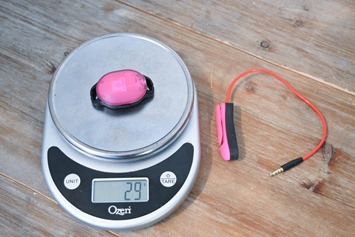 One roundish pod has the GPS module and battery, while the longer secondary pod has the audio module. Yup, it talks to you as you swim. 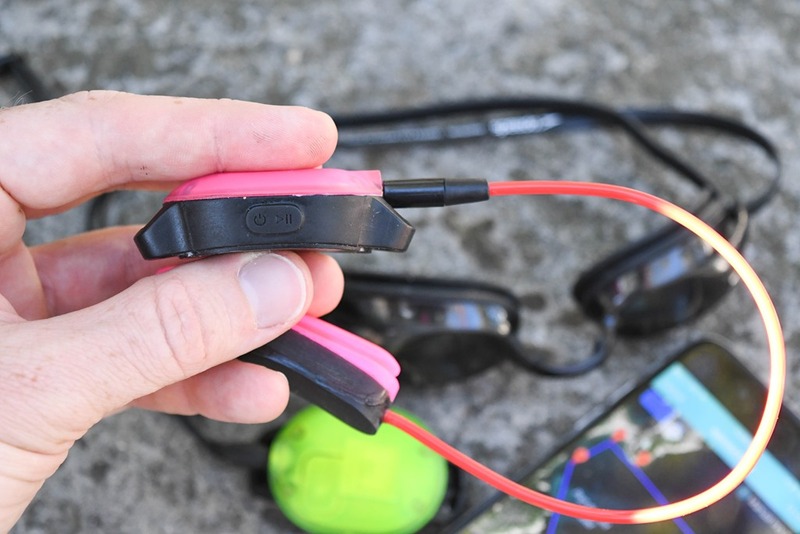 The audio portion attaches to your goggle straps on the side near your ear (but not on it), whereas the GPS pod sits behind your head facing the sky (also on the straps). 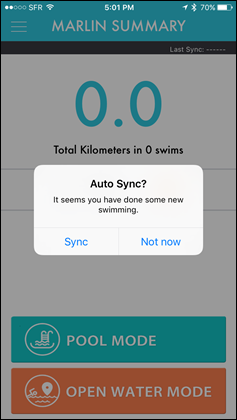 While you swim it’ll give you stats about your workout – such as pace, distance, and time. This helps the device to overcome the lack of a display. Now one of my big gripes about dedicated non-wrist swim trackers (such as the much older FINIS Hydrotracker) is the lack of clear-cut buttons and feedback on whether the unit is recording or not. Or whether it has GPS. Or whether it’s paused. It sounds simple, but it’s super frustrating to go for a swim and not have 100% clarity on whether or not it’s recording. In the case of the Marlin, it’s got four dedicated buttons. A power/mode button, a start/pause/stop button, and two volume/selector buttons. Oh, and it yells back at you exactly what mode it’s in – and even if it’s searching for GPS still. The unit charges using a small charging cable with any available USB port. The total weight clocks in at 41g. Though, this being a pre-production device, that’s 100% likely to change, since it has 3D printed parts on it. 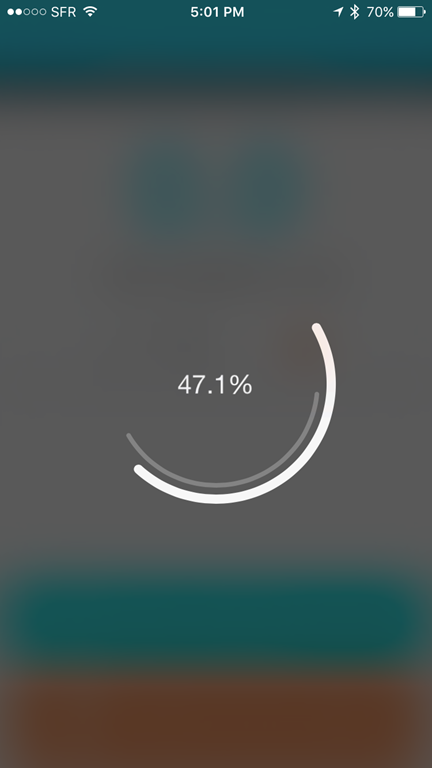 Now the one downside is that despite having all the core components to playback music, there’s no music storage or playback. In my opinion that’s a bit of an obvious oversight, as putting in a small 4GB storage chip would have cost almost nothing, but have greatly increased desirability for the product. The unit has an app that’s fairly well developed for being 4-5 months out. 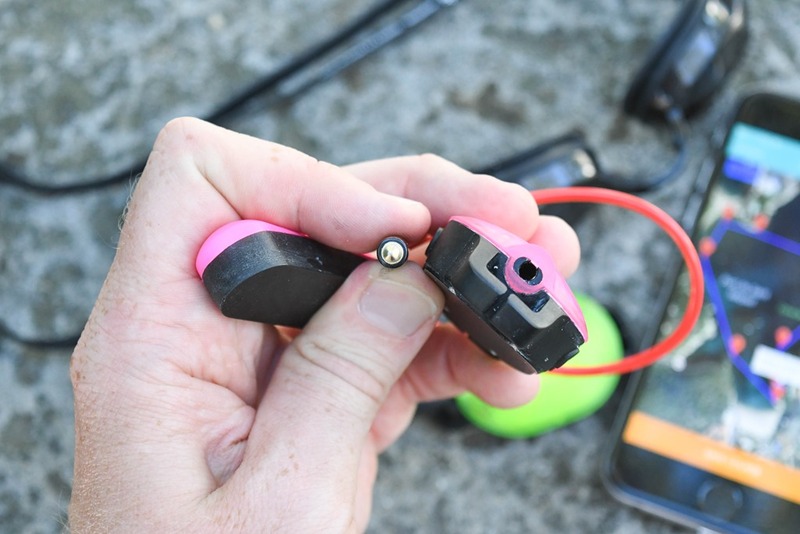 The app connects to the Marlin via Bluetooth Smart, and then allows you to configure settings for the device. Within the settings you can configure both the setup for the pool mode as well as the openwater mode. 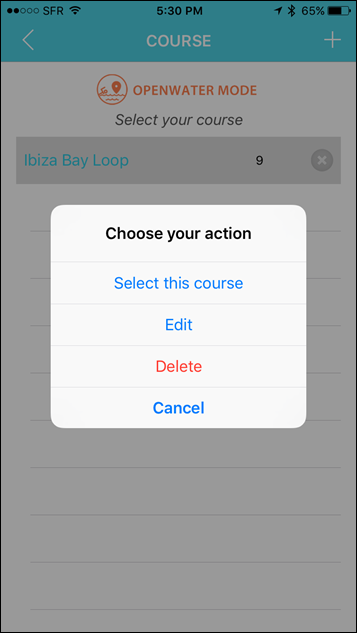 For example, in openwater mode you might have different audio alerts than in pool mode (such as course information). 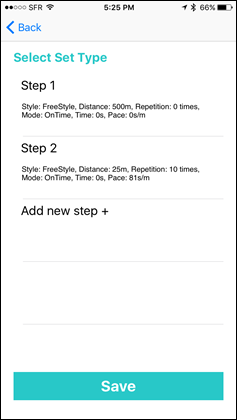 Whereas in pool mode you might setup a structured workout (which you can create and save numerous editions of). Note that while my focus here has been primarily openwater, the unit does work in the pool as noted above. However, it’s important to be clear there are two versions of the unit: A pool-only option (sans-GPS), and a dual pool/GPS option. Given the cost differences are pretty small, I’d just go for the dual version. I took the unit out for a test over the weekend creating a route to navigate around the bay. The app has a super simple tap to create style map system, allowing you to quickly draw up a map of where you plan to swim. 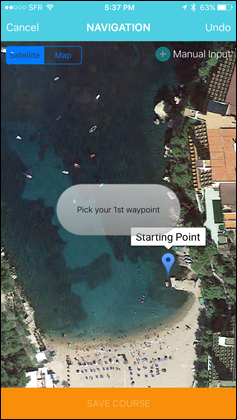 As with any time you create routes around water, be sure to use satellite view, else you may end up swimming over rocks in standard map views. Once you’ve created your course, you can go ahead and send it to the Marlin. When you do this the Marlin will actually audibly confirm that it has received the settings and waypoint/route details, which is kinda a nice little touch. Once you’ve found your way to the starting point, you’ll turn on the unit and switch to openwater mode. At which point it’ll immediately start looking for GPS. Like most GPS devices I found that if it was the first time I’d gone to that location it took a bit more time (about 1-2 minutes in total), whereas subsequent satellite acquisition from that location took mere seconds. 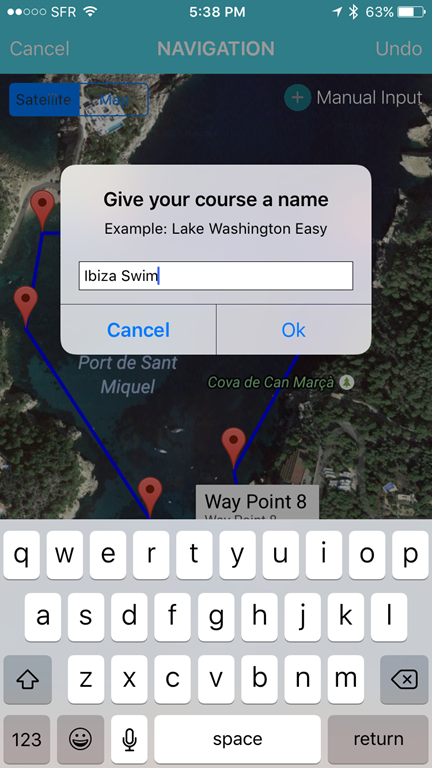 Before you left you’d have used the app to specify which openwater swim route you’ll be using (if any). You can also specify the audio announcements interval and other audio feedback settings. It’s all pretty straightforward. If you don’t remember exactly where you set your course up to start from (such as starting from a random point on the beach), the unit will actually give you directions to the starting point, which is kinda nifty. 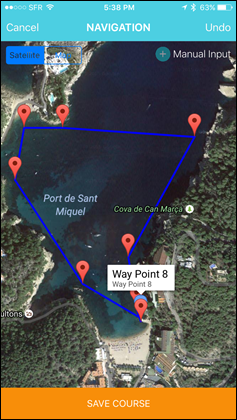 Once you begin swimming the route, it’ll give you directions to stay on course by telling you whether to swim to a given clock direction – i.e. ‘Swim to 10 o’clock’, or ‘Swim to 1 o’clock’. This works surprisingly well. There’s also an option for getting swim instructions as simple left/right, though I haven’t explored that piece in the water. During the swim the unit’s GPS distance matched spot-on to what my watches were showing me, especially during the first straightaway section. It was pretty cool. I had configured it to notify me every 50 meters, giving me my total distance. The audio announcements were somewhat normal up to 1,000m, and then got a bit wonky after that as it would pronounce 1,550 meters as ‘One Five Five Five Zero Meters’, which makes you concentrate extra hard on decoding the distance. Hopefully they’ll be able to address that in the ample time they have to release. Following my swim I hit the end button to stop the swim. In theory, this would have saved the swim and produced a pretty swim route graph like the screenshot from their Kickstarter page. But in reality, that didn’t happen. 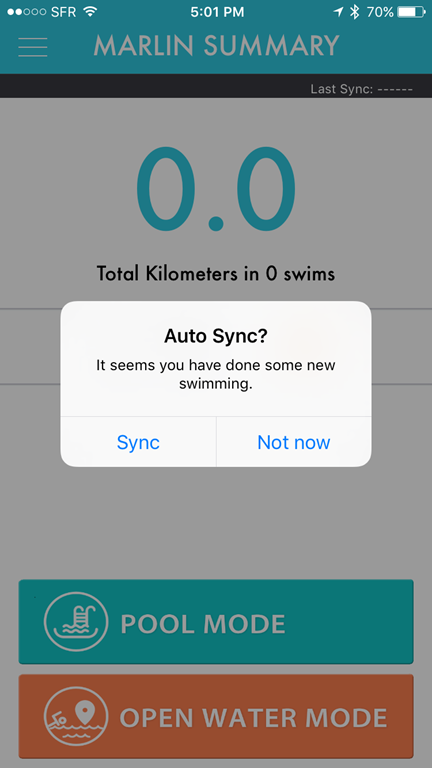 My swim went somewhere, but it’s not syncing to the app at the moment. A bit of a beta bug I’m guessing, and obviously a fairly disappointing one since I like pretty maps a lot. I also included in that video the route creation process as well as the sync process, to show you how it works. Overall, for a $90 device on Kickstarter ($150 at retail), I’m pretty impressed with it. 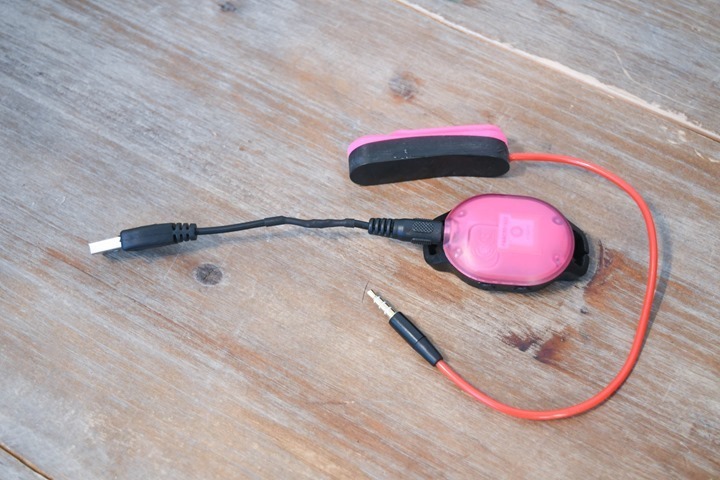 I like the assortment of buttons on it, and the audio feedback is super clear, both for general use confirmation (i.e. which mode you’re in), but also while swimming openwater. Not to mention that they’re still 4-5 months away from shipping, and this feels like they’re closer to 45-60 days of polish. Of course, this is only a single swim – and one that didn’t go perfectly after the fact with the app. I also haven’t tested the pool swimming portions yet. And being a Kickstarter/crowd funded device – you never quite know how it’ll turn out and what type of delays they might have down the road. 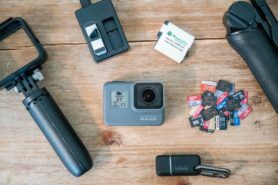 If you haven’t done Kickstarter projects before, I encourage you to read this post I wrote on the risks of it. But still – for a relatively (or totally) unknown startup – they’ve done good. Just don’t forget that unfortunately their campaign ends in 22 hours. While they’ve already achieved the minimum goal for production, usually more funding helps keep the project on track. So cool. 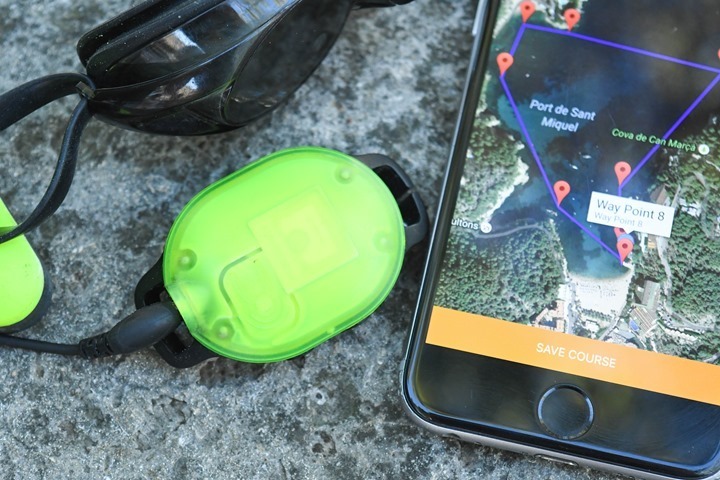 It seems like it would be difficult to keep the GPS connection when you breath, but I guess no different than a open water watch that’s constantly losing its way. I’m disappointed that it didn’t a chance to sync, but agree that, 5 months from Production, this is a pretty awesome state to be in. So I guess the main differences between this and the Iolite is the presence of audio cues and Bluetooth connectivity? …and that the audio cues make the Marlin not legal in triathlon competition, while the Iolite is? Yeah, which, are honestly pretty big things (in terms of differences). It was just so easy to transfer over the files and to do it via mobile is great. Oh yeah, being able to control / interact with it using your phone seems like it would be MUCH easier. 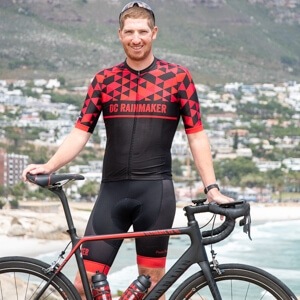 But designing it so that it’s not triathlon race legal (I’m assuming; their kickstarter seems to assume this as well) makes it much less attractive. 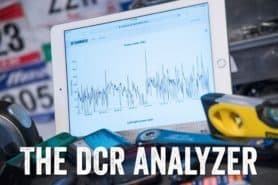 It makes your training open water swims easier, at the expense of training the specific skills you need in a race, where you then can’t use this device you’ve come to rely on. So count me as one that would like to see this either cleared for use in a race, or another model developed that can be. 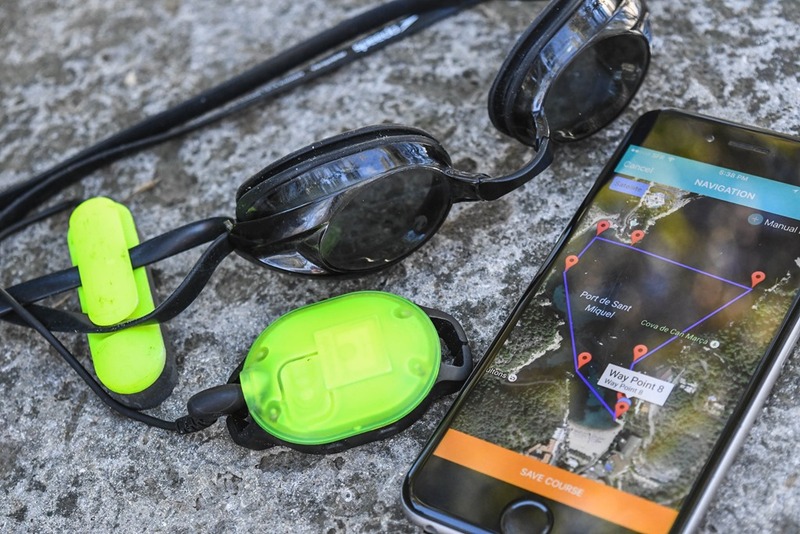 The Iolite is better but at twice the price and without Bluetooth it seems a lot easier to just get better at open water swimming. Any word on how this would work in and endless Pools. I would love voice indications on how long I have been swimming. Also… is this race legal? Having audio directions to stay on course would be a Hugue advantage. I don’t believe it’s race legal, though, they probably haven’t approached any certification bodies yet. I would think for visually impaired swimmers this would be a great device. Also I do agree with Ray I think they missed the boat not having this be a mp3 player as well. 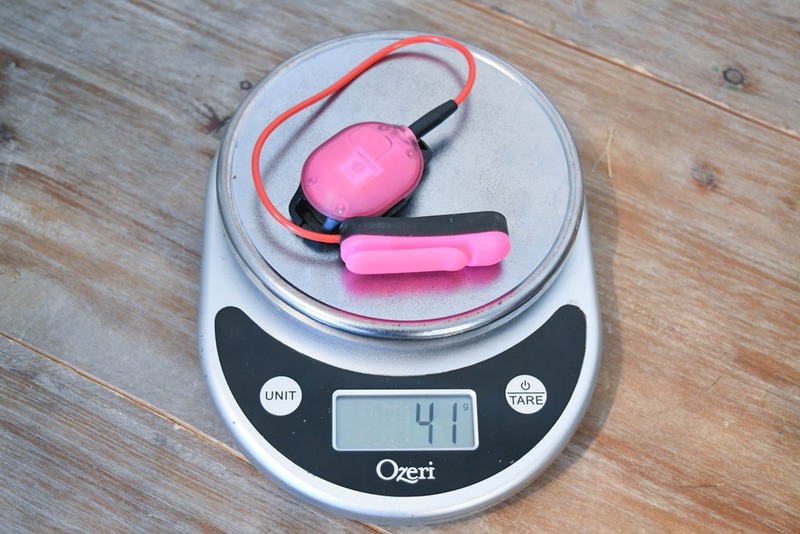 The amount of people that want a swimming mp3 player vs people that what some guidance in a open water swim is pretty huge. But this looks to be a great product and for 90. a great deal. Interested in how it performs. It might be a game changer. Imagine during an ironman, one doesn’t even sight, rather simply follows the audio instructions. That could save a few seconds/100 yard, meaning a few minutes in an ironman! I typically never watch your videos, but happened to click on this one. The underwater swimming shot at 2:16 is great! I would have been watching all along if I knew we were getting that kind of production value. I have zero experience with video, but it seems like it must have been a pain to position the camera at depth? It was just a funny little outtake that I figured I might as well include in what otherwise might be a bit of a boring video. In this case I just used a mini gorillapod tripod, which is flexible and easily fits under the longer swim shorts. I also locked out in that there were some rocks in that area, so I just swam down, plopped it in place, and it stayed put. Sometimes with currents and stuff they fall over, but this time it stayed in position. (Sidebar: On a swim the next day I actually lost the cam without realizing it. Sad panda. Spent about 30 minutes creating a search pattern for it to eventually find it down in some seaweed. I make a habit out of swiping my leg every few strokes for exactly this reason when carrying a camera there. But in this case I was sorta swimming backwards a bit between two shots and put it in a weird spot. Well very cool that it worked out so well. Makes me want to pick one up (something I had never really considered doing) just to play around with. Ha. That was exactly my thought when I watched the video: that in the time it takes to get the shot that thing could disappear. The perils of smaller and smaller technology! Thanks, as always, for the great mini review. Wish it was race legal as well. Something wonky with the sound on the video – the level decreases significantly in the transition from swim to demo of the app. Definitely an interesting product. 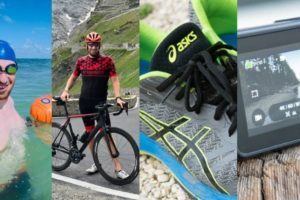 Do you have any insight on connectivity to fitness platforms (Strava, Garmin Connect etc.) or know whether Platysens’ has plans for developing these? Ray, what is your personal best for 1500m swim? Not 100% sure off-hand. My guess is openwater without a river (i.e. not downstream or anything), it’s about 22-23 mins. I’d have to go back and look at older race reports to see. SCY a bit faster of course. Swimming isn’t exactly my greatest sport, and since moving to Paris I swim rather infrequently given you can’t openwater swim legally anywhere in the city. And the pools are a total mess (15-20 people per lane). On the bone conduction communication path, can other people hear it? 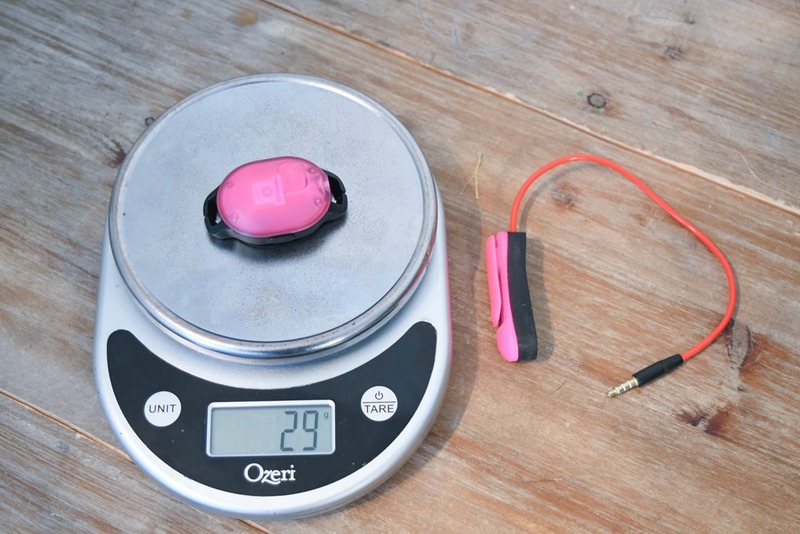 Maybe a tinny little buzz like when people have their ear buds jacked up to deafening levels? They had some quality issues and switched to a different plastic vendor a couple of months ago, but have been good in communicating. 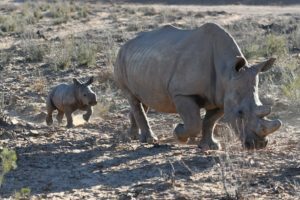 April seems to be the new mass production/delivery month. I’ve just received my Marlin and have taken it out for the first time. – I then skipped the first 2 waypoints – and accidentally skipped the the third because I was at the second waypoint but i did not get a confirmation that it had acknowledged it. Luckily i knew my way around and it found the 4th waypoint just fine. – I then passed the 5th waypoint to far to the sea and it wanted me to go back to it catch it and i turned it off. But it there a forum somewhere for users ? 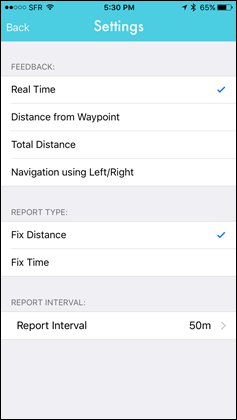 – On android I can’t find the waypoint radius settings ? – Any news regarding their plan to allow export of their data ? I can’t even get it to pair with my S8. It paired with iPhone but the app is unpolished. I asked about a forum for users on their facebook place and was just directet to their support forum. Quickly open 3 tickets and they have responded to 2 of them within half a day. I think that it would be useful to have a place for user to user discussions and not only the support site. 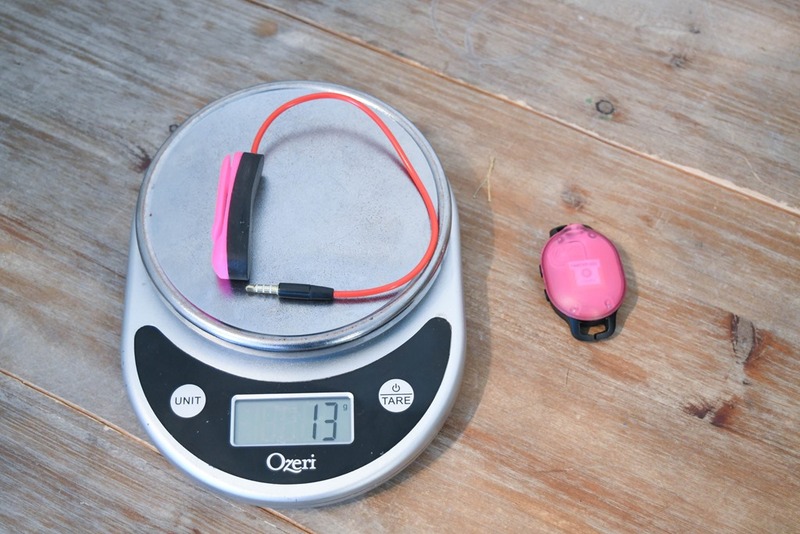 Same swim as before – just a comparison between my fenix3 and the marlin. I was swimming with a group and we had breaks for the rear to catch up every ~500meter. It is clearly visible that i was not good at keeping the Fenix above water while stationary as by the bridge in the upper left and by a boye further to see. – Audio is also okay but don’t expect miracles. you have to carefully listen or you will miss parts, especially since you have usually all kind of “water noise” when doing a turn. – Main problem: I am very disappointed about the bad accuracy: I got a lot of false positives (meaning additional/wrong lap counting). And by “a lot” we are talking about >50% more laps than i actually did. I know its not my stroke because my Garmin 920 counts almost 100% flawless. Support theys i should then them additional data (“diagnostic mode”) and they will improve the software. So lets see. 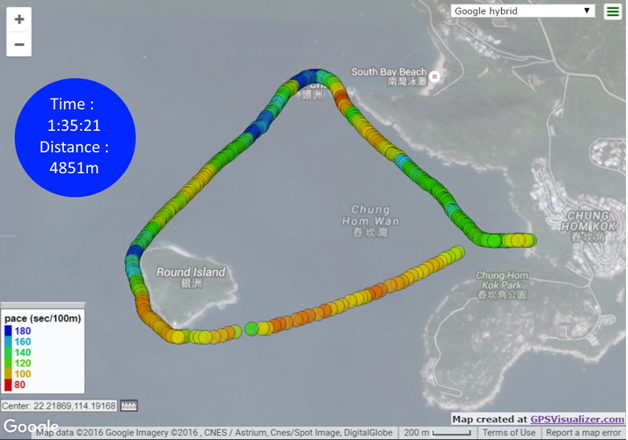 It just shows that the accuracy is of course much better if you keep a GPS device above water most of the time 😉 I’ve made a similar comparison before with my forerunner 920 and a GPSmap60 in a ISHOF SaferSwimmer buoy. The Fenix did loose GPS completely for 500 m between ~2000 m and ~2500 m.
But back to the function of the Marlin. Unlike last week where i accidental selected pool mode on my way in the water i actually had both the right course and started it with a GPS fix before entering the water. But i had issued with getting close enough to my waypoints. At the moment the proximity parameter is not available on Android and I know for sure that I was within 10 m of most of them. But I still had to press the + for 2 seconds to get it to direct me to the next waypoint. So in the end it did not recognize my swim as a known course. I was also wearing a Garmin Fenix3 and it recorded 58:57. That seems right as well as the 1:02 that including waking into the water and getting back up. 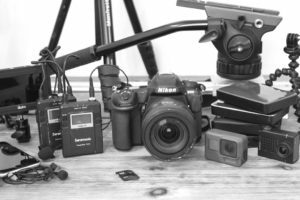 With regard to laps being inaccurate – have you tried to calibrate it ? 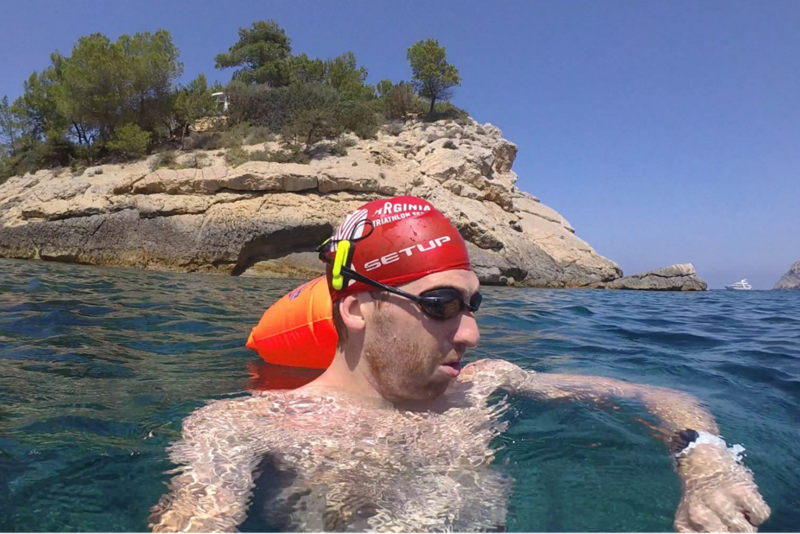 This week I did the firsts open water swims with Marlin. The precision seems good to me. The volume is generally good but when air and waves grow it becomes difficult to ear messages. The main issue I found was the fact it gives speed advice in Km/h and that is completely unuseful! 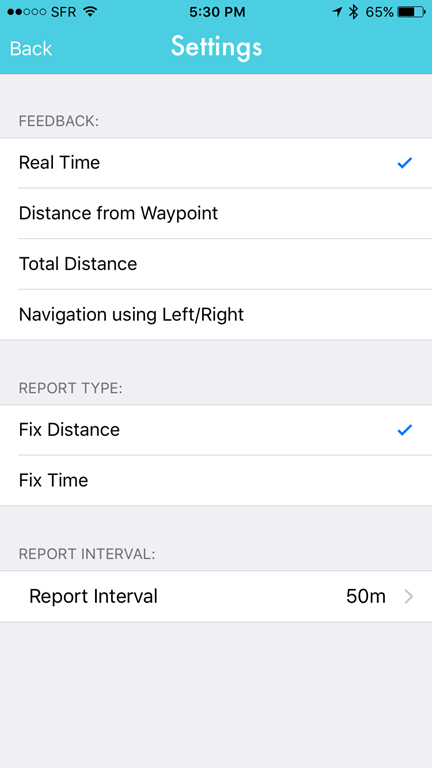 Has anyone else been having issues syncing their workouts to the app to view the route and other swim metrics? Everything else has worked pretty well both in the pool and open water for me. Wondering if you’ve done any testing with this now it’s a more established platform? 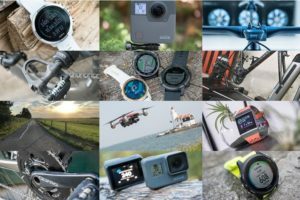 Is it a recommended buy or are there better/cheaper devices out there? Im blind and I have two of theses.. we use them at the lake Open water swims. It’s awesome I don’t have to be tandem to someone else had I know I’m going where I need to be going. It’s loud you can hear it well with the bone conduction. It’s very accurate and keep you right on the line … it’s amazing it really is really is. i sold it after some playing around. It certainly matured over time (software-wise) but it doesn’t fit my usecase (which is mainly indoor pool). 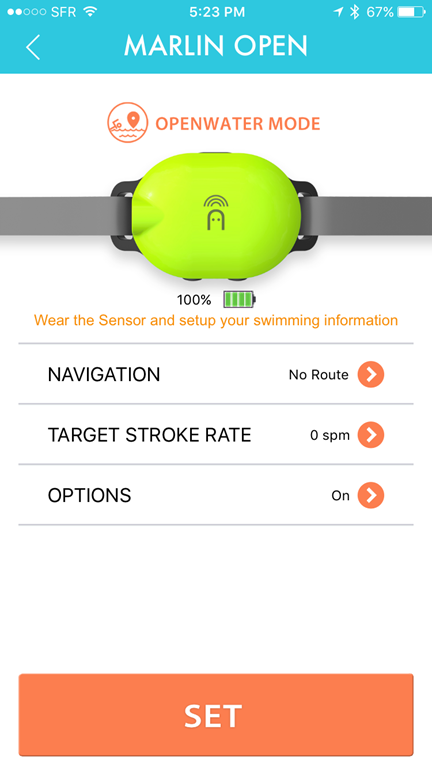 I currently use a FR935 which tracks my swims and does everything i need. i am very used to pause/unpause during breaks, it’s basically a reflex. Having to think about one additional device is additional stress for me and sometimes i forgot to restart the marlin again after a break. 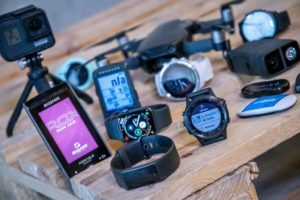 What i would love to see in the future: A wireless addon-device for the garmin watch which is basically an “audio-extension” and would rely on the watch data. Of course this would not cover everything which Marlin does.